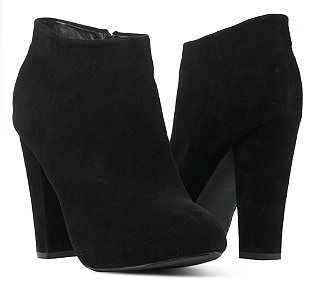 I have been searching for the perfect black ankle boots for a while now. They have to have a slight chunky heel so they give me a bit of height but so that I can also walk in them, not cut off my legs too much and most importantly not cost too much as they are likely to get caught in the rain/snow/mud. Originally I wanted these boots from Topshop (for some reason they have taken the black ones offline) but at £62 they weren't exactly screaming affordable! Imagine my delight then when I walked into New Look and saw these beauties. Unfortunately they weren't available in my size in store or online so in the end I opted for a pair from good old Primark. They are really comfortable and for £15 I think they are definitely affordable and I won't be worrying too much about keeping them in pristine condition. The only thing I am worried about is whether they make my legs look too short when not worn with black tights? What do you think? Keep or return? I say keep as they don't cut off your leg, in my opinion, because of the dip (no idea what actual name for that is) at the front. I agree, I think they look great! The dip in the front does not make your legs look shorter! They can be worn year round because of the length! I love them! The cut is a little unusual but I don't think it's a problem! :) You have really great legs (jealous), and these just draw attention to your slim ankles in my humble opinion. Definitely a keeper to me! I had the same issue as you, desperately want a Topshop pair but can't bear to pay the price! Just ordered a similar pair from H&M...great minds, eh?! I am like this with boots too I just bought some tan ones from New Look with the dip at the front and they are much more flattering than ones that are straight at the front. The Topshop ones are lush but I think the Primark are a good cheaper alternative. It's hard to tell from that photo if they cut off in the right place but from what I can see they look pretty good. Do you rate Primark heels? I've only ever bought pumps/flats from there. Swooooooon at the Topshop pair and your Primark ones are such an awesome alternative! I say keep because they look pretty amazing! I think they look lovely! I bet you'll find them really good to pair with lots of things as well. I want to get myself a pair of cowboy boots at some point, but haven't found quite the right pair yet. I also have quite a few pair of boots but am still yet to find the perfect pair! I want a pair of Victoriany-style boots with buttons as well! Definitely keep. They're absolutely gorgeous and look amazing. They'd go with so many things as well. I think they look great! Keep, keep, keep! You legs look fine! I vote keep! You had better keep these little bauties! Oh I do like them! Maybe try wearing them with black tights if you're a little unsure? For £15 you can't go wrong so i say keep them :) I think they'll look great with black tights, with anything tbh! Wish those Topshop ones weren't so pricey tho boo.